I Heart Dirt and You Can Too! Who Is Rick Bayless Anyway? My Garden is Smokin' ! Spring Fling Garden Party Giveaway! It's been awhile since I've done a Green Thumb Sunday post, but this week, Echinacea 'Tiki Torch' burst into bloom and I just had to share. Orange just isn't my very favorite color in a flower, but 'Tiki Torch' clearly demonstrates that it depends on the flower. I really like this. Besides its scrummy color, I'm tickled by the whimsical little petalettes, curling at random around the plastic spiked centers and the crowns of gold. Gorgeous! I do like this color and the one Jodi showed a while back called Hot Papaya. I am just going to have to make a bigger bed to hold all these wonderful colors! On another topic, do you think GTS kinda died out or is still hanging on? I'm conflicted. This is a really unusual Cone flower! I am into double flowered ones this year. i bought a oink and a white one last year and they both are blooming right now. Love them! It is indeed a beautiful shade of orange and I love the halo of yellow. Like you, I'm not that keen on orange but this flower is gorgeous. It must be the colour combi of that beautiful heart and the petals. It's a winner! Beckie ~ Oh I remember that 'Hot Papaya' and it WAS gorgeous! I've not seen that one in the garden centers though. min hus ~I'm not sure. This is the first I've participated in quite some time. I'll have to check it out more thoroughly. KMG ~ I like the doubles, too. I've got a pink one and also 'Coconut Lime' which I love. 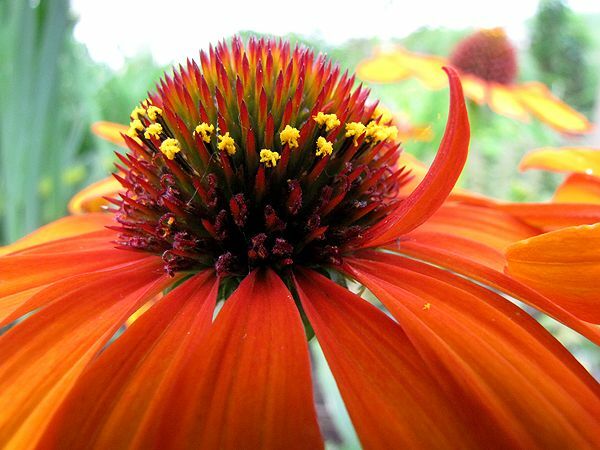 I just love coneflowers, period! Connie ~ It's just been blooming like crazy ever since it started. You'll love it! Lisa ~ I love that halo, too. Some of the other coneflowers also have that. Yolanda Elizabet ~Isn't it funny how we like some flowers in certain colors and not others? There are a lot of pink flowers that I really like, but I do NOT like pink zinnias! I don't like orange in general, but I love this one, and I love Cosmos sulphureus. 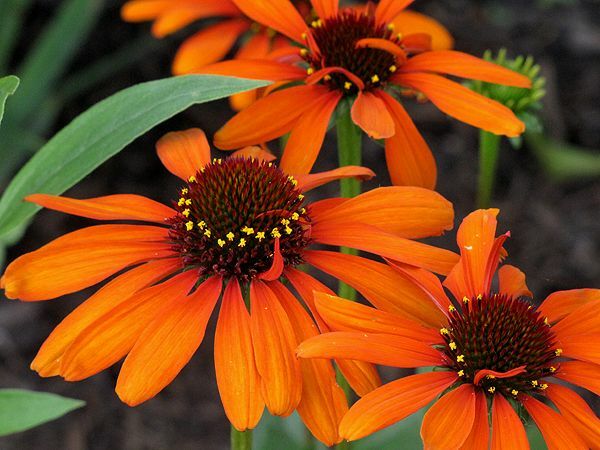 What a gorgeous coneflower! I'm also not a big fan of orange, but was instantly won over by your photos. I am crazy about coneflowers, and am looking forward to some new blooms this year from some I started from seed but didn't bloom last year.